By now, you might have heard Ben Roethlisberger plays pretty well against the Baltimore Ravens. 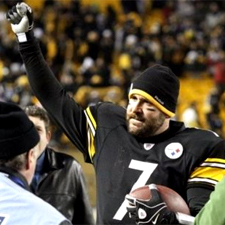 You probably also know some of Roethlisberger’s signature moments against the Ravens. 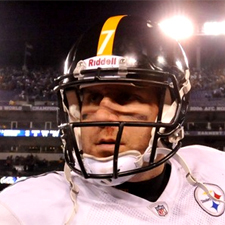 But you’ll never guess the career highlight Roethlisberger most cherishes against the Ravens. Would you believe it’s his broken nose in the game in Baltimore last season? “Ben Roethlisberger, you have to give him credit – with all that he’s been through to stand in there and play the way he played today for that football team says a great deal to his football team, to the organization, to the whole city – ‘I am committed and I am here to play for this football team.’ He deserves some love for the way he battled today.” – NFL HOF player and NFL Network analyst Michael Irvin (December 5, 2010). Call it part of Roethlisberger’s continuing maturation. Entering his eighth year, Roethlisberger has such a command of the system, offensive coordinator Bruce Arians believes his quarterback could call an entire game with ease. He showed flashes of it two years ago while throwing for 4,328 yards operating out of a no huddle. Last season, working behind a patchwork offensive line, Roethlisberger led the Steelers to the Super Bowl. Now, the line is healthy and the players at the skill positions have never been deeper. Roethlisberger’s teammates think he could be sitting on a career year and finally join the likes of Tom Brady and Peyton Manning in the conversation of the best at his position.